Well this is one of those dishes that I have been playing around with in my mind for a little while now. Today was the ‘day’ that I pulled it all together and it just it the spot. The weather is hot again today, the sun is blazing and it just feels like we are off on holiday somewhere. My hubby went off shopping for me this morning and when he came back he was more than ready for his lunch, so I pulled this all together in about 30 minutes, and if you make the sauce ahead, then it really is a meal that can be made in 15 minutes. I made a thick tomato sauce, starting with onions, mushrooms, garlic and diced chorizo sausage I fried them all of in a pot and then added some tomato puree, its what I had in the larder. Once it was all bubbling away, I removed a couple of ladles into a small Le Creuset frying pan, I made a couple of little dents in the mixture and cracked the eggs into the spaces, then I topped them with a little grated cheese, I used cheddar, but feel free to add your favourite cheese, Parmesan is also great in this dish. I then popped a pot lid on top of the frying pan and left it there for approximately 5 minutes, but just long enough to firm up the egg white but leaving the yolk nice and soft**. These little frying pans are great to take to the table too, I placed a napkin on to the plate and then placed the pan on top. Be careful as the frying pan will be very hot. ** Remember the egg yolk will continue to cook when you remove it from the heat, so serve as soon as it is ready, if you prefer a soft yolk. 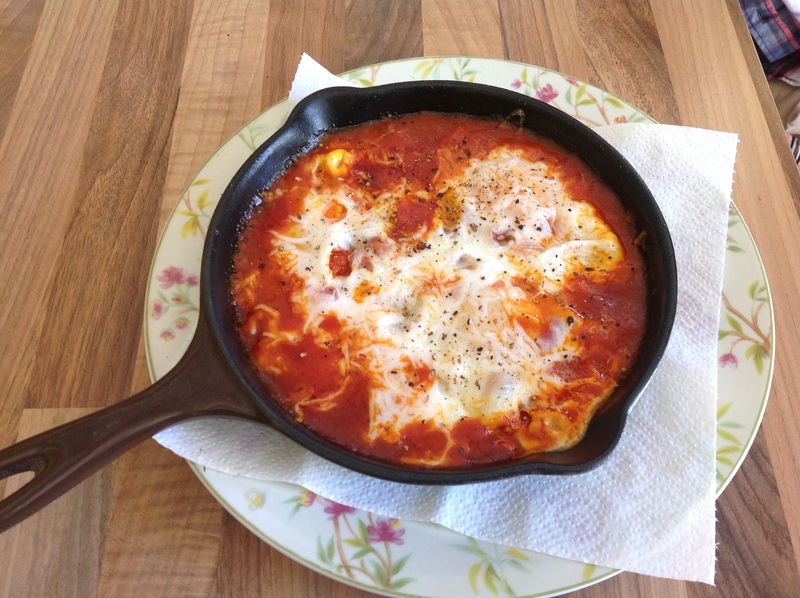 Delicious 'baked eggs' in a rich tomato sauce, ideal for any breakfast or brunch. Add you favourite sausage or bacon or leave out for a vegetarian dish. Add the chopped onion and cook for 5 minutes until softened, add the garlic and cook for 1 minute. Add the sliced mushrooms and cook for another 5 minutes. Add the chorizo (if using) and cook for 5 minutes until they start to release the oils. 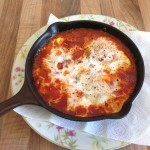 Use a small frying pan for each serving, big enough to hold the sauce and 2 eggs. Ladle some of the sauce into a small frying pan and allow it to come back to the boil, make a dent in the sauce with the back of a spoon and crack an egg into the well. Continue with the other egg. Season the eggs with a little salt and pepper. Sprinkle the top with a little grated cheese. Remove the frying pan from the heat and transfer to a plate. Cut some crusty bread and use to soak up the to sauce and egg yolk. The egg yolk will continue cooking, serve right away if you like a soft yolk. Leave out the chorizo and you have a vegetarian dish. Change the chorizo sausage for your favourite sausage.